The Global Alliance for Trade Facilitation is a public-private partnership for trade-led growth. We believe that international trade should be simple, fast and cost-effective, creating new business opportunities, enabling greater economic and social development and reducing poverty. 2017 was a landmark year as we brought together over 500 stakeholders from government, business and civil society through public-private dialogues, gained five new companies as official Alliance partners, and leveraged US$ 820,000 of in-kind support from the private sector into our work. 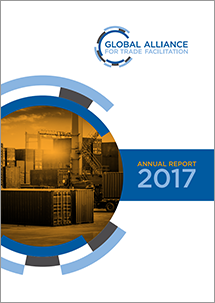 With six projects up and running, the Alliance laid strong foundations during the year and the report summarises the Alliance’s progress in implementing commercially measurable trade facilitation reforms.